Borussia Dortmund were looking to put an emotional few weeks that culminated in a UEFA Champions League exit behind them. They went away to begin their journey of consolidating a place at Europe’s top table for next season against Borussia Monchengladbach who were also looking at a European place after a mid-season revival under Dieter Hecking. The Foals also had to put a 5-3 loss to Hoffenheim from the previous round behind them. Dortmund chose to rest Pierre-Emerick Aubameyang and Julian Weigl and start with a trio of Christian Pulisic and Ousmane Dembele either side of Marco Reus up front. Dortmund also had a chance to take a closer look at Mahmoud Dahoud who would join them in the summer. Dortmund started pressing Monchengladbach from the start in a 4-3-3 shape with Pulisic, Reus and Dembele pressing Andreas Christensen, Tobias Strobl and Jan Vesteergard preventing the home side from finding any sort of rhythm. Dortmund won a free-kick within 60 seconds before Pulisic capitalized on a Christensen slip to earn a debatable penalty in the tenth minute. Dortmund also built-up in a 3-3-4 with Matthias Ginter, Sven Bender and Marcel Schmelzer forming a three chain at the back and pushing up into a high line. Raphael Guerreiro and Erik Durm were tasked with pressuring Nico Elvedi and Oscar Wendt whenever Gladbach moved the ball to them in the early phases of possession. Guerreiro would push into the midfield line and only moved into the front four if Pulisic dropped deep to receive the ball in the half-spaces while Durm pushed high into the front four. Gonzalo Castro would only push higher up when Lars Stindl dropped deep to ease transition while Mikel Merino who would replace an injured Nuri Sahin would also push up to win second balls and counter-press. The Foals split their centre-backs with Strobl or sometimes Dahoud dropping in between them while their fullbacks Elvedi and Wendt pushed closer to the touchline as options for out balls and to make it more difficult for teams to press them. This sometimes looked like a 3-1-3-3/3-4-3 and was a facet of Gladbach’s build-up under Andre Schubert. Strobl would drop into the defensive line with Dahoud just in front of the back three as Dortmund would find it difficult to mark the back three, fullbacks who were positioned deep and wide as well as Dahoud. Pulisic was tasked with marking both Christensen and Elvedi when Dortmund switched to a 5-3-2 while Dortmund chose not to directly engage Dahoud in possession. Last week, Hoffenheim remedied Gladbach’s build-up shape by some coordinated lateral pressing forcing Wendt or Elvedi to play the ball back into the center where Nagelsmann’s team forced turnovers in a congested midfield. Dortmund would start in a similar fashion moving a block of pressure wide but the injury to Sahin forced Dortmund to switch to a 5-3-1 and subsequent 5-3-2 which meant pressure was more man-orientated. 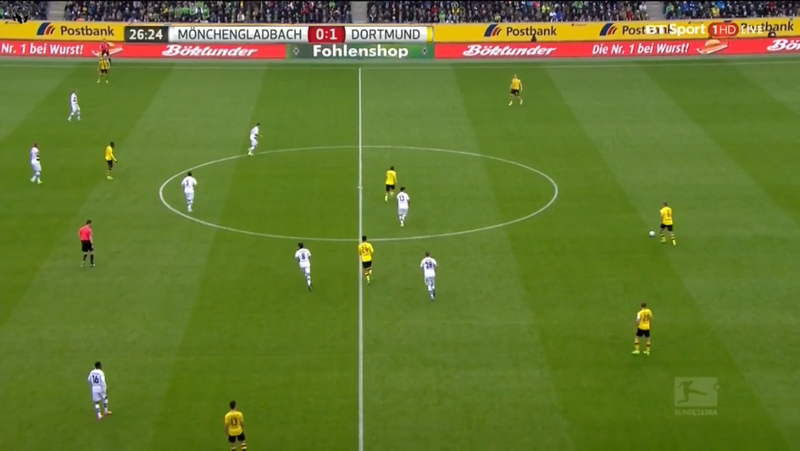 Dahoud was granted more space in between the lines as Dortmund chose to sit back when he received the ball as he moved in between the fullbacks to receive the ball. He mostly passed the ball back to the centre-backs finding most of his passing options covered but there was an instance in the first-half where he received a pass from Elvedi to use a subtle body feint to beat his nearest man and play a line-breaking pass that nearly found Stindl but was intercepted by Bender. The video above shows another instance where Strobl received the ball much higher which prompted Dahoud to move past Castro and Pulisic who gestured to each other to keep an eye on him as Dortmund sat in a 5-3-1 after Sahin went off with an injury. Dahoud then pushed against the away side’s backline before dropping back in between Dortmund’s midfield and defensive line for him to receive a ball from Hoffman which led to him spreading the ball to Traore and eventually having a shot. Dortmund built-up in their aforementioned 3-3-4 shape with The Foals pressing in a 4-4-2 medium block with pressure on Dortmund’s double-pivot in Castro and Merino from forwards, Stindl and Hahn. Dortmund would frequently look to play into the wide channels, especially when balls out to the deeper wider areas would trigger a higher press which Dortmund could beat with lobs to Dembele or Pulisic. The two young wingers are such gifted ball carriers that this facilitated many of Dortmund’s dangerous counters. Dortmund would circulate the ball among their three centre-backs and double-pivot till spaces were found but began to be sloppy in possession after the 30-minute mark. 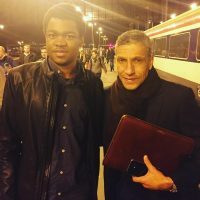 Bender and Dembele would lose possession in the deeper areas before Merino eventually lost possession leading to a goal. The picture below shows how Monchengladbach targeted Merino in possession prior to the goal as whenever he would beat the first line of pressure, Dahoud would push out of his position to pressure him in a 2v1 or 3v1 situation.The home side knew the Spaniard lacked the rhythm of regular game time and would fall victim to a few mistakes. After half-time, Monchengladbach switched from a 4-4-2 medium block to a 4-3-3 high press as they began to pressure Dortmund higher with a continued focus on Merino and Castro in the 2v1 situations. Dortmund switched to their 5-3-2 more regularly after the injury to Sahin in the first half as they also began to force Monchengladbach into mistakes for quick breaks. Monchengladbach’s pressure allowed them to win the ball higher and was the catalyst for some of their chances but also resulted in them conceding the second goal. Durm chipped a ball into the path of Dembele which Vesteergard headed into the path of Castro who played in Dembele to thread in a through ball for Aubameyang to score. 3 of the 5 goals conceded in this game stemmed from high-pressure situations as the home side mustered three goals on target with them scoring from a Dortmund mistake and an own goal. Dortmund deserved to win the game 3-2 as Merino improved as the game progressed while it may be worth keeping Bender in defense as he finished with a 93% pass succession rate and 5 tackles. The substitutions of Laszlo Benes and Patrick Hermann proved to be inspired substitutions as they can add zest and pace to a Monchengladbach attack that can sometimes be pedestrian. Dortmund’s win was even more important with Hoffenheim drawing against Koln in the battle for third place and the coveted automatic UEFA Champions League group stage spot.